Cats' Tongues Keep Them Clean, But How? Cats’ Tongues Keep Them Clean, But How? How much time do your cats spend every day bathing? Mine all spend a lot of time keeping themselves clean. This seems to be especially true at night, after we’ve gone to bed and the kitties are with us. We turn out the lights, and the bathing commences. Those tongues of theirs are little miracle-workers on that front, but how exactly do cats’ tongues clean their fur? The barbs on cats’ tongues are small enough that they don’t actually function very well as little combs, like we might have thought. They face backward, which is why she swallows her fur (and anything else that gets stuck on her tongue). Scientists, however, have found that the little barbs don’t have to function as combs, since they function like Velcro. Alexis Noel, an engineer at the Georgia Institute of Technology, got curious about how cats’ rough tongues actually help to clean them when she saw a cat get his tongue stuck on a blanket. The cat was able to free himself by pushing his tongue into the blanket, rather than pull it out. That unhooked him from the loops on the blanket. Those little barbs are hook-shaped and sharp. They remind Noel and other scientists of cats’ claws, actually. They glide over untangled fur, and can actually tease out tangles by rotating deeper into the tangle after getting caught. That rotating action also wedges food particles between the barbs. This is why cats’ tongues are uniquely suited to cleaning all the meat off of the bones of their prey. And afterward, they groom themselves because instinctively, they need to remove all the traces of their meals from their bodies. Their Velcro-like tongues can catch any food particles left on them, helping to remove the scent of fresh-kill. 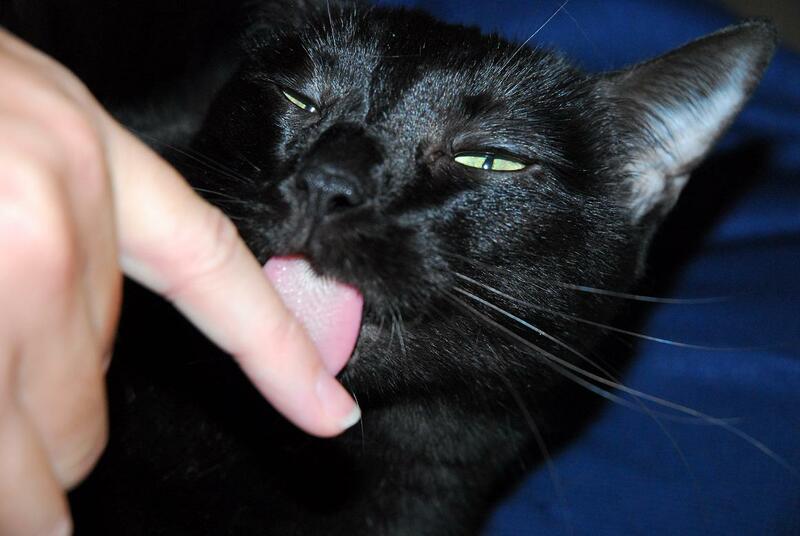 My cats also like using their tongues to wash me, which can get painful after a little while because I don’t have their fur to protect my skin from all those little barbs. Cats’ tongues are still somewhat mysterious to scientists, but at least now we have a better idea of how cats use them to stay clean.